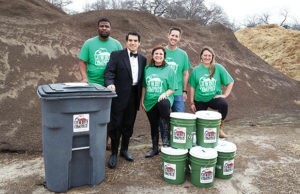 Award winning Cowboy Compost, LLC was created by two resident leaders in Fort Worth: Fort Worth Symphony Orchestra’s Music Director, Miguel Harth-Bedoya, and small business owner and entrepreneur, Johanna Calderón. 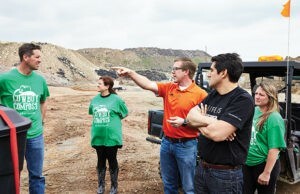 As global citizens who have seen the effects of waste management programs across the globe, they have dedicated their passion, talents and resources to raising awareness about waste issues and its impact on the environment. Cowboy Compost provides residential and commercial composting services in the Greater Fort Worth, previously unavailable. We help make the food composting process simple and easy for households, businesses, and organizations, by providing education, equipment and products, instructions, and regular food waste pick-up. Cowboy Compost is committed to developing custom-design food composting programs, and providing five-star customer service at affordable prices. We ensure quality control so that collected food waste is free of contaminants prior to delivering to local professional composting facilities, where organic food waste will help create nutrient-rich soil packaged as a bagged product, which is available through Cowboy Compost. A small change is all it takes to help reduce waste. Go Zero Waste!